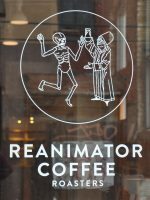 ReAnimator has enjoyed steady growth from its original coffee shop in Fishtown. Now there’s the roastery, another coffee shop near the city centre and a soon-to-be fourth location in West Philadelphia. The roastery doubles as a delightful coffee shop, occupying the ground floor of a large, old building in an industrial stretch of Master Street in the Philadelphia neighbourhood of Kensington. The building was clearly split into two at one point in its history, ReAnimator following this left-right divide, although there’s also a front/back divide between coffee shop (front) and roastery/training/admin (back). The front runs along Master Street, punctuated by six tall, wide windows (matching the high ceilings inside) with doors at either end. The main entrance is on the right, although there’s step-free access up a small, shallow ramp via the left-hand door. A handful of two-person tables line the pavement outside, while the windows continue a short way along the right-hand wall, flooding the interior with light. The layout is simple, with the bulk of the coffee shop in the right-hand section. From the door, there’s a narrow bar under the windows in the right-hand wall, while a large bay provides more seating under the front windows. This is a wooden bench, curved around at either end, and holding four square, two-person tables. Opposite this is the counter, which runs from the left/right dividing point to about the mid-point of the right-hand side. This houses the Synesso espresso machine and its grinder, along with the till. The counter then continues along the right-hand side, where you’ll find the pour-over station, the cakes occupying the corner, diagonally opposite the door. If you keep going, there’s a back-half to the counter, which acts as ReAnimator’s training room and, beyond that, there’s the roastery proper, complete with sacks of green beans, waiting to be roasted, and bags of roasted beans, waiting to be dispatched. Although there’s no “staff only” signs, it’s fairly clear that you shouldn’t wander back there. The coffee shop part of ReAnimator continues to the left. There’s an identical bay along the front, running all the way to the left-hand doors, complete with another four two-person tables. At the back, occupying the spot where the counter is on the other side, there’s a solitary-looking five-/six-person communal table. One of the reasons I didn’t write up my original visit is that I lost my notes, so while I can tell you that I had the La Union Colombian single-origin espresso, that’s all I can say. Back then, ReAnimator was running its Telemetry blend, a decaf and one of the single-origins through the Synesso, with three or four single-origins available as pour-over. On my return, there were five single-origins, all of which could be had as pour-overs or espresso, with a different single-origin coming onto the menu every two or three weeks. After a brief chat with my barista, I opted for the Rwandan Gatare single-origin as an espresso. This has a sweet, almost syrupy taste to the first sip, coupled with quite a kick, but no sharpness. There was more acidity on the second and third sips, but not overwhelmingly so. I can definitely say that it’s not your average espresso! I followed that up with the same coffee as a pour-over through the V60, paired with a cinnamon pecan bun. This was excellent, with a light bread dough and a sweet but not sickly cinnamon sugar. The coffee, compared to the espresso, was smoother and more subtle, with a much fruitier taste. Holding its own as it cooled, it was just as good cold as it was hot. If you enjoyed this Coffee Spot, then take a look at the rest of Philadelphia’s speciality coffee scene with the Coffee Spot Guide to Philadelphia. This entry was posted in Cafe/Roaster, Cake, Coffee Shops, Laptop Friendly, Philadelphia, Retailers, Roastery and tagged include by Brian Williams. Bookmark the permalink.